My apologies, Dear Reader, as I know I skipped the past week of posts rather unexpectedly. While I did some writing on Monday, particularly on my resume and cover letter for a job I really want, I didn’t have enough energy left to set up my posts for the week. I wish I had because the next day my shoulder decided that it didn’t feel like playing nicely any longer; between the pain in my shoulder and neck and the numb fingers and elbow from the pinched nerves, I couldn’t easily sit at my computer and write. Luckily, it’s relaxed once again so I can finally get some of my projects and writing done..only a week late. Sigh. 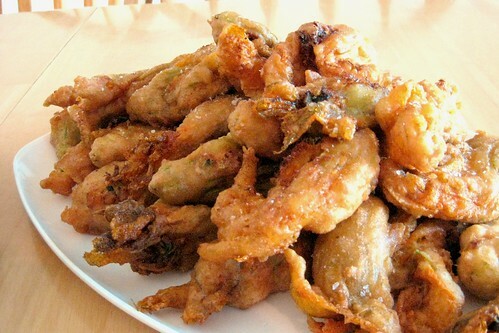 I’ve always wanted to try zucchini flowers. I’ve been seeing them on various food blogs and tv shows (when I watched tv anyway) but getting ahold of them is another story. I heard that the local farmer in Tooele who lives across from Arby’s (and if you’re local, you know the house, it’s the one with all the flowers) would sometimes be willing to sell a baggie of them for a dollar or two if you could catch him before he packed them all off to whoever he sells to. I never have. Of course, I usually catch him at the market, not at his house, so it’s not really surprising. So when we went to our usual hispanic market on Tuesday, I was very surprised to see baggies of freshly-picked zucchini flowers. (I would laugh if we brought them back to Tooele where they started from, but I have no way of knowing if they came from him.) They weren’t very expensive – $2.50 for a half-full bag of an unknown quantity. I immediately started looking for recipes when we got home. 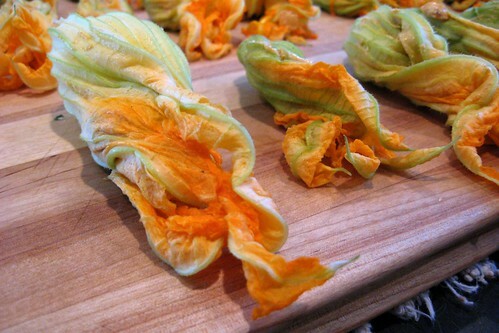 According to what I read, zucchini flowers don’t last long (do flowers ever?) and need to be used within 24 hours of purchase. Some people eat them raw but most seem to like to fry them. The inner pistil (or stamen, whatever it is inside the flower, I am no botanist) thingie needs to be removed before stuffing. I decided to adapt several of the recipes I found into one and then further adapted it to what was on hand when I went over to a friend’s to cook them up. (She has a deep-fryer and also wanted to try them. Win.) She had a bunch of different cheeses in her fridge, so it turned into a delicious quatro-formaggi blend. These are definitely labor-intensive. It took me about an hour to prepare everything and I definitely recommend twisting the petal tips together. It helps them hold their shape and not open when you batter them. All in all, I think I got three dozen flowers out of the bag — wow! If you come across the flowers and want to try something new, you should. In a deep skillet over medium-high heat, heat olive oil until shimmering, then add diced zucchini and onion. Saute until nicely browned. Remove to a medium bowl. Combine cheeses, smoked paprika, lime zest and juice along with a healthy pinch of salt and pepper with the zucchini mixture. It will be quite thick. Add half-n-half or milk to thin it slightly to a workable consistency, like cake frosting. Rinse the flowers well and pat dry. 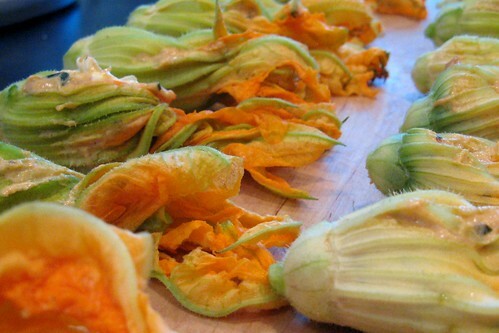 Remove the little pistil thingie inside each flower along with any sharp leaves and discard. Carefully stuff each flower about half-full and twist the petals carefully to keep them shut. Arrange on a board. My small blossoms took about 1/2 tsp of mixture to come up half-way and large blossoms took between 1 tsp and 2 tsp to fill. In a small bowl, whisk together all of the ingredients for the tempura batter. Dip each filled flower in the batter and swirl to coat. Drop carefully into the hot oil – you don’t want to splash. Don’t overcrowd the fryer either – you don’t want the oil temperature to drop very far. Fry for 1 to 2 minutes until lightly golden brown. They will get a shade or two darker while they cool. Remove to a rack set over paper towels or newsprint to drain off excess oil and sprinkle over with salt. I only filled my flowers half-full and many of my flowers were very small. Some were huge, so if you have the big ones, the filling will only make about a dozen. For this reason, I’m not putting a quantity for the flowers – there is way too much variation. A mandoline is a godsend here. I used what I had – look in your fridge and use any combination of melting cheeses for approximately 6 ounces total weight. Ricotta would be good, as would Monterey jack. Really, anything that melts will work.